Running a small business is a bit like riding a rollercoaster, there’s always an exciting start, plenty of twists and turns and that weird mix of laughing, screaming and maybe crying. Finally, you stumble off and take a few moments to rebalance yourself before you’re looking for the next ride to jump on. Before we start another white-knuckle year, ask yourself, who helped you mop up the blood, sweat and tears from your 2015 ride? Who got off the sidelines and joined you centre court? Who got in the driving seat when you were too tired to drive? You and your business partner have probably shared more late nights, life-or-death situations and bad gags than in all Lethal Weapon movies combined. It’s highly likely this person’s got your back and is the only one who understands the sacrifices you’ve made running your day to day. And now that the two of you made it through the year with your heads above the water, perfect chance to draft a heartfelt note to remind them how thankful you are that they’ve not turned in their badge and that you really do make a good pair. As the saying goes; money makes the world go round. Though that’s not factually correct, money does keep millions of small businesses, well, in business. Whether your cash flow comes from your uncle in Utica or a Kickstarter crew scattered around the globe, invest a little of your time to pat the backs of your financial backers. These are the people who have placed trust in you, your brand and business and literally buy into what you do. As the saying goes, a little thought and detail goes a long way. So what’s more detailed than crossing the t’s and dotting the i’s of a handwritten card? Say thanks for gobbling up your artisanal goods, happily obliging your service fees and offer them lunch on you next time they visit. Think back to that moment when your mentor has helped steer you away from expanding your product offering to square watermelons. Yes, that kind of advice is priceless. You trust their experience, in return, they keep your spirits high and take pleasure from you doing well. Drop your sensei a note saying thank you for all those nuggets of advice. Or maybe send a square watermelon. And last, but NEVER least, it’s the special task force behind you. These helpers are not on the payroll but have most likely clocked lots of hours keeping you happy, healthy and sane. 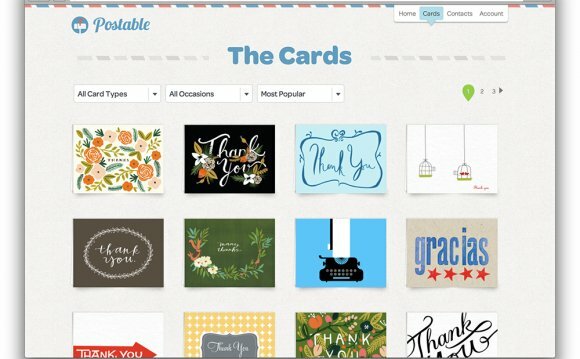 How To Send A Business Thank You Card Online!